One of the primary challenges of design power electronic design is how to effectively remove the heat generated effectively; especially when these devices can dissipate tens or hundreds of watts of waste heat. The performance of the semiconductor is limited by the junction temperature so it is important that the thermal characteristics of the design are fully understood. 6SigmaET is capable of modelling semiconductor devices in detail so that accurate prediction of junction temperature can be achieved. 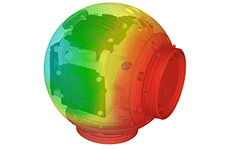 Complex heat sink and enclosure designs can be imported and analysed. Time varying characteristics as well as temperature dependent properties can also be handled easily. With an increasing demand for precision, automation and monitoring industrial equipment is becoming increasingly complicated. Equipment designed for use in an industrial environment must be reliable and robust enough to operate in harsh industrial environments. 6SigmaET can be used to validate the thermal design of industrial equipment before it is used for a mission critical application. The powerful parallel solver enables creation of large and complicated models, which are often required when modelling equipment in sufficient detail. LEDs are very temperature sensitive. Most designs using LEDs will need thermal management in the form of heat sinking to ensure correct operation (light output and colour). Accurate thermal models are vital for complex and aesthetically designed heat sinks. 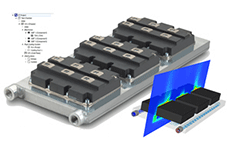 6SigmaET is able to model small details of LEDs and geometries of designer heat sinks to ensure the best possible performance before prototypes are tested. 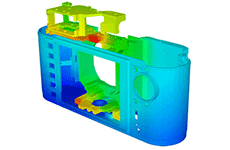 6SigmaET has been designed to make the thermal modelling of IT equipment simple and fast. The secret here is the existence of a large number of intelligent parts which can be used to build the model instead of making it out of abstract blocks. 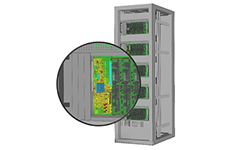 Card, chassis and drive bays make placing and switching modules in the right locations easy. Heat sinks, cold plates, thermo-electric coolers and heat pipes can all be called upon when necessary. 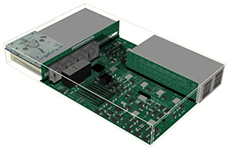 The motherboard design can be imported from a variety of EDA systems using standard formats such as Gerber, IDF or IDX or can be created using the 6SigmaET design tools. The components, resistors, capacitors, inductors etc. also work intelligently in 6SigmaET. Modelling large cabinet designs in 6SigmaET is easy. A simplified model can be created using the large library of IT equipment which is supplied with 6SigmaET. This library is also extensively used in Future Facilities data centre software. Of course, detailed models can also be constructed and the fast efficient parallel solver available in 6SigmaET (on both multi-core/processor systems and Windows HPC clusters) ensures a speedy result is produced even when multi-million cell models are created. Consumer electronics are getting smaller and more powerful, which increases the thermal challenge. Tablets, mobile phones and other personal electronic devices can often be cooled only by natural convection. The complete CAD geometry of the device can be imported into 6Sigma ET, which reduces the time spent creating the model. The printed circuit board design can also be imported from ECAD (EDA) design software. 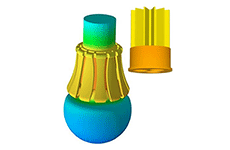 The 6SigmaET library can be used to store parts for reuse in future projects.